I just finished reading, Michael Hyatt’s book, Platform: Get Noticed in a Noisy World, and although its focus is mainly on creating an online brand, there are so many connections with what we do as school administrators, that I had to share here on the blog. Although as a public school, we are not a company trying to make a profit, we do spend time every day trying to promote our “brand” – or at least we should. Like any company trying to create a loyal customer base, we proudly display our school logo on our clothing, on banners outside our school, on school documents, email signatures, etc. We want our students, our parents, our teachers to be proud of our school. We want to have our “brand” mentioned positively in Facebook posts or in conversations around the community. We know that any mention of our school, positive or negative, reflects on us as administrators. It’s important, therefore, to be aware of how our school (our brand) is being viewed by the community. We have all heard about how one negative incident – school shooting, inappropriate behavior by a teacher, bullying – has had the effect of tarnishing a school’s reputation – its brand. Although, we can’t foresee when a crisis will take place at our school, we can work on creating a positive image that can hopefully lessen the negative effects of the crisis. For example, if someone posts on Facebook, “There was a fight over at the middle school. I don’t know if my kid is safe over there,” this can have the effect of damaging a school’s reputation. 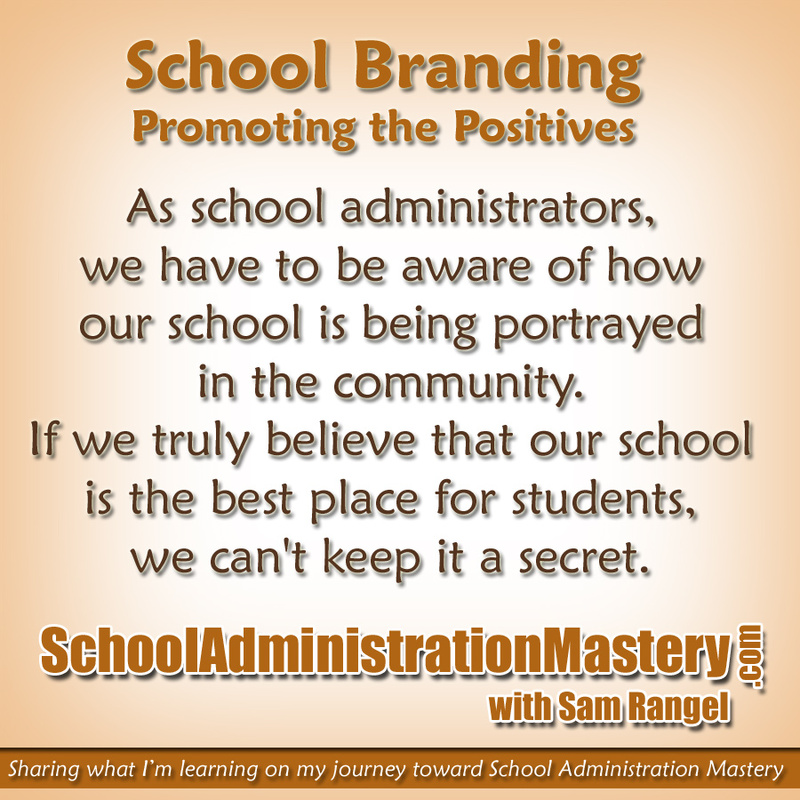 If we have successfully promoted the positive aspects of our school (branding), people will be more apt to defend us, instead of agreeing with the negative comments. Although most parents will send their child to the school nearest their home, wouldn’t it be great if we have created a “brand” that is so positive that parents who live out of our boundaries would want to send their kids to our school? In future posts, I’ll be sharing what I’ve learned in Michael’s book about branding. 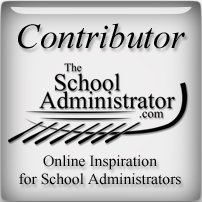 I’ll connect it with what we do every day in our roles as school administrators. How do you know what parents say about your school? How often is your vision statement shared to your parents? Teachers? Students? Do you have a Facebook page? Is it updated consistently? What is your school lobby experience like? How do you receive parent or community question/concerns about your school? What is your school slogan? Does it promote your vision? Is your school website easy to navigate? Is it updated consistently? Is your school attractive from the street? Are the grounds kept up? How active is your PTA in promoting the successes of your school? How does the community know how great your teachers are? As school administrators, we have to be aware of how our school is being portrayed in the community. If we truly believe that our school is the best place for students, we can’t keep it a secret. Parents want to know that they are sending their child to a school where he/she will be given the best education available, but if all they hear are the voices of those complaining about the school, then their trust in us will waver, leaving us to expend time and energy trying to gain that trust back. A little work promoting the positives (branding) will help us reassure parents and all stakeholders that their trust in us is well-founded. What do you think? 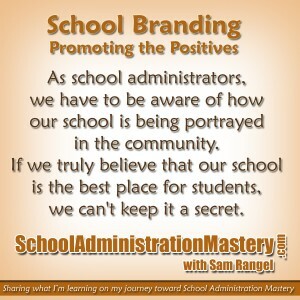 Is branding important for schools? I would love to hear your opinion. Please share. I’ll notify you via Twitter when I upload the next part of this series. You can follow me here. Until next time, here’s to your journey toward School Administration Mastery! Here is a link to Michael Hyatt’s book. You can follow him at MichaelHyatt.com.